The start of supports today marks the first big step towards delivering accessible affordable quality childcare .Extra childcare supports are now available for up to 70,000 children and their families with over 75% of eligible services sign up with numbers continuing to rise. 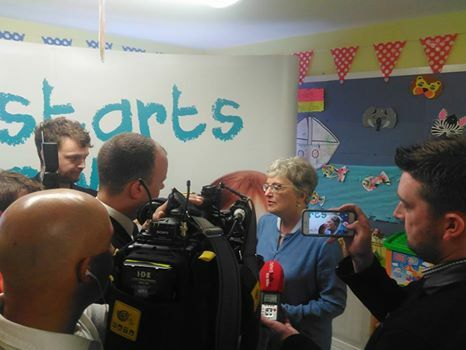 Speaking at the Tallaght Childcare Centre, Minister Zappone also confirmed that the number of providers signing up to deliver the extra supports continues to rise. 2,805 providers are now on board representing 76% of eligible services (3,705). “I want to send best wishes, support and congratulations to children starting childcare services across the country in the coming days.It is a big moment for children, parents and providers. I wish them all well. Today we also take the first big step towards accessible affordable quality childcare with extra supports for up to 70,000 children. · targeted supports for those families who need it most. These targeted supports can reach €7,500 per child per year – representing a 50% increase on previous supports. I want to acknowledge the great work undertaken by my officials, Pobal and providers over many months to bring us to this moment. The sector has responded positively with three quarters of eligible providers already signed up to deliver supports – a figure which continues to increase as services return from the summer break. The names of signed up services will now be placed online at www.affordablechildcare.ie and will be updated on a regular basis. This will assist parents in accessing the supports put in place by government to lower the cost of childcare for families in Ireland. In recognition of the extra administrative work services have undertaken I will be making an extra payment of €3.5m available before the end of the year – bringing the total for such payments in 2017 to an unprecedented €18m. While there is no evidence of subsidies being abused – if action is required I will act. In addition in the coming weeks an Independent Review of the Cost of Childcare will commence. It also has a tight timeline and will report back in ten-months, in time to inform decisions around Budget 2019. As Minister I have always been clear. Our childcare goals are ambitious. They have to be if we are to correct decades of under-investment. Much more investment is needed in order to secure our goals. In the coming weeks I will be working with parents, providers and Government colleagues to ensure investment continues in Budget 2018 and beyond.